For many of us, August means back to school. For others, it’s simply another busy month on the calendar. Whether you’re preparing to move into a dorm, gearing up for another year of teaching, or just embracing the hectic season, it’s likely time for a study space refresh. The key to finding a great study spot is understanding your own needs. Do you prefer to work in a quiet space or do you need little background noise? A study space doesn’t have to require an entire room; just find a nook or corner away from distractions and make the most of the space you have! Try to choose a spot with an interesting backdrop so you won’t have to spend your day staring at a white wall. Don’t forget to check the area for easily accessible outlets and a solid WiFi connection! Maximize your space by choosing functional furniture. A desk with extra storage is an easy way to store books and files. Remember, start by utilizing what you already have. Consider repurposing a decorative basket into a trash can, or repaint an old bookshelf to give it a fresh style. Investing in a comfortable chair with proper support will allow you to work longer without the distraction of aches and pains. Thankfully, you won’t have to compromise style to find function. A cluttered desk will leaving you feeling overwhelmed, but an organized space promotes productivity. Start by decluttering and labeling everything. There are plenty of stylish storage options to choose from like printed folders, fabric bins, and floating shelves. Dedicate some time to organize the devices on your desk. Untangling the web of chords will clear up valuable space and make the items you need more accessible. This can be accomplished by using cord covers, desk grommets, cord winders, or other office organization supplies. It’s time to let your personal style shine through! The fun part of creating your study space is decorating it. Choose a theme, such as modern glam, traditional, or boho chic, and decide on a color scheme. It is best to stick to only a couple of colors to maintain a calming atmosphere. 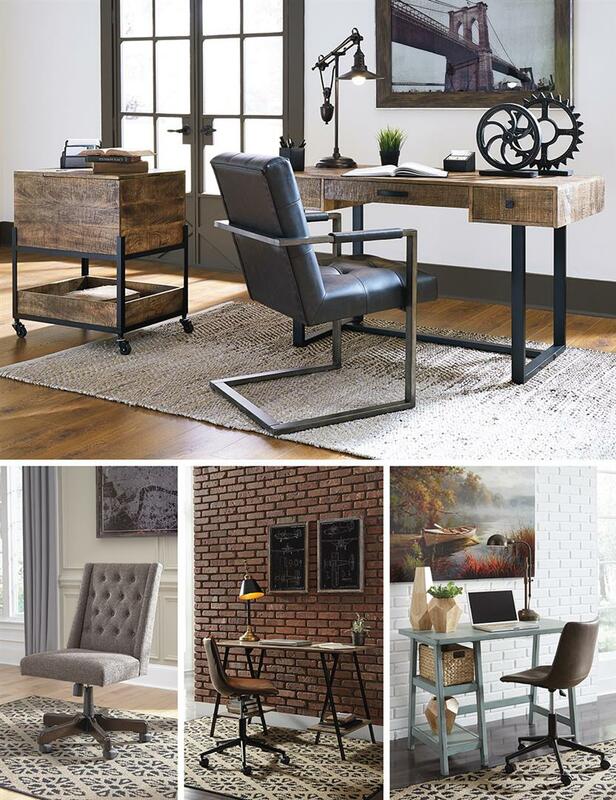 Keep in mind that the style of your office should complement the rest of your home decor. 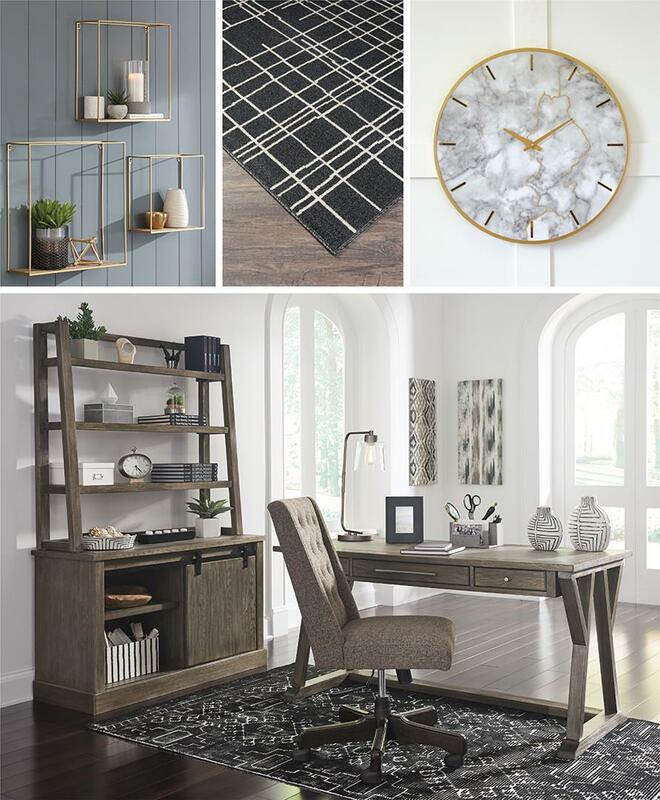 Start by adding purposeful decor: a metallic clock, trendy calendar, or sleek pen holder. A small plant will provide life and a pop of color for your desk. Fill a few picture frames with family photos and motivational quotes to keep you smiling. Finish up by tying your space together with a rug! TIP: When decorating a small space, choose pieces that are taller, not wider. The final step in completing this project is determining the appropriate lighting. If your study area is low on sunlight, or if you tend to study into the wee hours of the night, you’ll need to add a floor or desk lamp. Be cautious of allowing too much light, which can create a glare on your screens and cause eye strain. An adjustable lamp is a great way to add style and functionality. This time of year can be overwhelming and exhausting, but if you create a space you enjoy spending time in, you’ll be ready to take on whatever this year brings!